Do you feel exhausted or weak, like you’re moving mountains just to make it through a normal day? Maybe you find yourself struggling to remember names or the right words – they’re on the tip of your tongue, but your mind goes blank. Are you short of breath after casual activity such as walking or climbing a flight of stairs? All of these can be symptoms of B12 deficiency. Low B12 levels can cause a range of painful issues, from fatigue to memory loss, and the consequences of long-term deficiency can be devastating. B12 is vital for your nervous system and the production of genetic material like DNA and RNA – the building blocks of every single cell in your body. That means a B12 deficiency can wreak havoc with everything from your digestion to your mood. Without healthy B12 levels, you can experience exhaustion, memory trouble, muscle weakness, shortness of breath, stomach upset, and more. B12 deficiency is serious. Studies prove that low B12 causes an increase in risk for cardiovascular disease.1 And it’s not just your heart health in danger – B12 affects your mental wellbeing, too. In fact, B12 deficiency has been linked to depression and anxiety disorders, as well as increased symptoms in autism, schizophrenia, and other mental illness.2-3 With so many grave consequences, it’s obvious why maintaining your B12 levels is a priority! So how do you know if you need more B12? The best way to find out is to consult your healthcare provider to have your levels tested. There are also some well-known risk factors for having less optimal levels of B12. B12 Boost is made with a pure, high-quality form of B12, and we test to prove it. B12 Boost is tested at every step of production to be sure it is what the label says it is and noting else snuck in – so many brands don’t have that level of quality control! It’s also free of sugar and artificial preservatives. B12 Boost couldn’t be easier to take: just pop a tiny berry-flavored lozenge in your mouth and let it melt! The primary ingredient in B12 Boost is methylcobalamin, a naturally occurring, easily absorbed form of B12. B12 Boost also contains natural berry flavor and the sweetener mannitol (a sugar alcohol that won’t affect blood glucose levels). For a complete list of ingredients, nutritional facts, and other label information, check out the Nutrition tab on this page. FAQ: What is B12 Boost? As a dietary supplement, dissolve one B12 Boost lozenge in your mouth once daily. 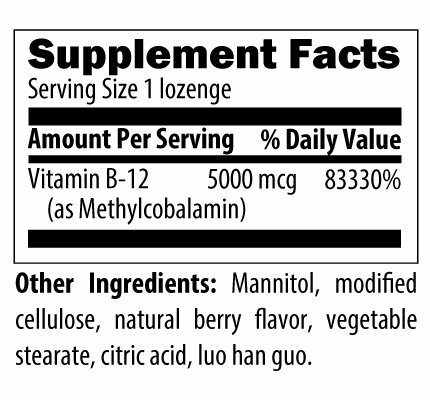 Every berry-flavored lozenge contains 5,000 mcg of powerful methylcobalamin (B12). For maximum absorption, it’s important to let the lozenge dissolve entirely, rather than chewing. As with all supplements, please check with your healthcare provider to be sure B12 Boost is a good fit for your health and needs and to find out what dosage is right for you. B12 Boost can safely be taken every day for as long as you want to enjoy its health benefits. If you’re vegetarian, over the age of 50, drink alcohol regularly, or take acid reflux medications, then it’s important for you to check with your healthcare provider to check your B12 levels and find the right level of supplementation. FAQ: The bottle label says B12 Boost contains 83,000% of the recommended daily amount. Is that right? First of all, congratulations on being an intelligent consumer who reads labels and asks questions! Taking your health into your own hands is so important when it comes to making smart choices about your diet and supplement use. Yes, the bottle label is correct. The reason B12 Boost contains so much more B12 than the US recommended dietary amount is because that recommended amount assumes two things: 1) You are eating sizable portions of meat daily to get B12, and 2) you are absorbing it all correctly. That’s not true for a lot of people, especially those at risk for a B12 deficiency because of age, a vegetarian diet, medication use, or alcohol consumption. One of the great benefits of Vitamin B12 is that your healthy body is able to use exactly what it needs and safely flush the rest out of your system with no harmful side effects. And of course, if you have any concerns, please do consult your healthcare provider.